Symco Group buys and sells remanufactured Oce Pagestream 466 Plus as well as provides onsite maintenance of the Oce Pagestream 466 printing systems across the US. In addition to the 466 / 466 Plus printing systems, Symco Group also buys, sells and maintains the entire line of Oce Pagestream to include the Oce Pagestream 372/372 Plus, Oce Pagestream 744/744 Plus, and Oce Pagestream 932/932 Plus printers. Symco Group also sells parts and supplies for the Oce Pagestream printers. The PageStream 466 Plus is equipped with the next generation SRA2 controller. The fastest, most powerful controller of its kind, the SRA2 gives you access to entirely new levels of functionality, speed, and performance. With the multiple resolution mode feature, you can support legacy, existing and future applications at 240 or 300 dpi resolution – without time-consuming applications rewrites. Advanced paper transport technology enables both pinless a pinfed paper for wider print width new paper-handling flexibility and impressive cost savings. 466 images per minute letter-size, two across. 854 images per minute printing 6 x 9″ forms landscape, two across or portrait, three-across. Duty cycle of up to 12 million images per month. Switchable resolutions of 240 and 300 dpi. IPDS or Xerox datastreams (with Océ PRISMA Printer solution). Pinless or pinfed paper. Wider print width of 18 1/ and paper weights from 18 to 40 pounds. Enhanced paper handling, monitored electronic for registration. Reduced paper costs using unfinished papers, no disposal of feed hole margins. The answer is the Page Stream 466 Plus printing solution from Océ Printing Systems USA. The PageStream 466 Plus produces up to 466 letter- sized images per minute in two-across portrait mode and 854 6×9” images per minute in two- across landscape mode. resolutions, data streams, document sizes, and paper widths. You also get support for both pinless and pinfed paper all in one machine. If your print volume or needs change, the PageStream 466 Plus can be field upgraded to a PageStream 932 Plus Twin to print 932 duplexed, letter size images per minute, portrait, two-across. Sound like the solution you need? It’s all within reach with the PageStream 466 Plus printing system. The key design feature of the remarkable new PageStream 466 Plus is an innovative paper transport system that enables the use of both traditional pinfed and pinless forms. In fact, the PageStream 466 Plus is the first digital continuous forms printer in it’s class that helps you cut paper cost as well as production time. With integrated pinless technology, you benefit from myriad advantages. There’s no need to use pre-punched roll paper, so you print more efficiently by using the full surface area – to a width of 18 1/4”. With this capability, you can use wider range of paperweights, and print 6×9” forms, two across landscape or three-across portrait. Because paper usage is reduced, you save on paper costs, require less lead time to order and eliminate the inconvenient edge trimmings. And that’s just the beginning. Océ patented pinless technology means faster speeds, shorter service time, and easier handling. The PageStream 466 Plus is more reliable than traditional pinfed devices, thanks to electronic synchronization that ensures precise registration on every page. What’s more, you can switch from pinless to pinfed paper at any time- seamlessly. Image quality today is a critical requirement for any high-performance printing systems. With this in mind, the PageStream 466 Plus offers the new multiple resolution mode feature, which provides simultaneous support for multiple resolutions in a single machine. The PageStream 466 Plus accepts input resolutions of 240 or 300 dpi and prints them on a 600 dpi LED array, as standard. The result is greater flexibility, more effective use of your printer resources, and the ability to process legacy applications without time -consuming applications rewrites. What makes the PageStream 466 Plus such a production printing powerhouse? The new SRA2 controller features nine parallel processors and significantly more power. You benefit from performance that is two times faster, memory capacity that is four times greater, and more connectivity and flexibility than you imagined possible. All of which gives the PageStream 466 Plus the muscle to handle the most complex applications and fast, new interfaces like Ethernet with ease. In fact, no other architecture is so well suited for current demands for flexible performance. initial expectations for this revolutionary architecture have been proven time and time again, through platform changes, performance upgrades, functional enhancements and memory expansion. What you really want to know, of course, is will the capital investment you make in the PageStream 466 Plus today continue to bring future returns? Look no further- with innovations like resolution switching and the future-proof SRA2 controller, you can rely on the PageStream 466 Plus to handle legacy, backup, existing and emerging applications today and for years to come. Need to connect your PageStream 466 Plus with multiple platforms? The PageStream 466 Plus integrates into most industry-standard host and server environments. Of course, it is supported by the PRISMA family of servers that extend the performance of PageStream printers across a broad range of processing platforms. Meanwhile, an integrated Type II intelligent paper processing interface (IPPI) enables complete workflow management through the attachment of up to six conventional pre-or post-processing devices. The PageStream 466 Plus expands your choice media. With the ability to switch from pinless pinfed paper feeds, you can process many more types, weights, and sizes of paper. Delivering crisp, clear imaging quality, page after page, printing on non- traditional paper stock is practically a non-issue. And with value-added options such as Magnetic Ink Character Recognition (MICR) this capability is extende even further. In addition to paper-handling flexibility, the PageStream 466 also supports the QCDS (quick change developer station) technology. With the QCDS you can switch out the standard developer station and print MICR – only when you need to. Just one more innovate way that the PageStream 466 Plus lets you make the most o your printer investment. Symco Group buys, sells and maintains (on-site, depot and advanced exchange maintenance options) check scanners from all the leading check scanner manufacturers including Canon, Burroughs, Digital Check, Epson, Magtek, Panini and RDM. Symco Group also sells maintenance kits and supplies for all the scanners we sell and support. If you are looking for one or more check scanners, maintenance kits or supplies please contact Symco Group at 800-878-8002 or email us at info@symcogroup.com. The CR-190i check transport can help financial institutions, utilities, and other organizations that handle large volumes of checks improve the efficiency of payment processes and treasury management. This results in faster access to funds, reduced costs, and increased ROI. The features offered by this check transport are ideal for high-volume remittance processing, lockbox, and back-office/branch capture. Examples based on typical settings, rated in checks per minute with U.S. personal checks at 200 dpi in black and white or grayscale. ** Calculation based on scanning speed and typical daily time of usage. Symco Group has a client who is selling a Cheshire TLS (Tab, Label, Stamp) 2″ Tabber. If you are interested in receiving more information including pricing and/or pictures, please contact Symco Group at 800-878-8002 or info@symcogroup.com. 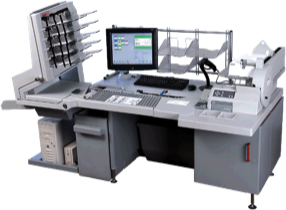 The Cheshire TLS System has been designed to provide the busy mailing professional superior performance for tabbing, labeling and stamp applications. From the caster-enabled base, to production rates exceeding 30K pieces/hour (depending on media or tab/label/stamp), the needs of the professional mailer have been answered. Setting up a job with the Cheshire TLS system is easier than most mailing equipment. The Cheshire TLS offers a dual tabbing configuration for meeting 2009 USPS postal regulations for tabbing booklets. Transport belt speeds of 0 to 600 fpm (182 m/min.) for tabs < 2” (<5 cm) in pitch. Symco Group has a client who wants to sell two Kern 3000 high speed mail inserters. Unit one has a count of 2,471,645 and includes 970 sheet feeder, folder with turnover, 2 ZS inserters, turnover, inserter, exit, 1 divert bin, camera system and exit conveyor. Software level for unit one is Rev 3.45. Unit two has a count of 8,217,856 and includes a 971 sheet feeder, folder with turnover, 3 ZS inserters, inserter, exit, 2 divert bins, camera system and exit conveyor. Software level for unit two is 3.53. If you are interested in learning more about these units or are interested in buying, please contact Symco Group at 800-878-8002 or email us at info@symcogroup.com. The Kern 3000 is a legend in high-speed performance. This machine has been the fastest inserting system on the market since 1992, accomplishing 26,000 filled envelopes per hour. The K3000’s incomparably fast cutting, folding, grouping, inserting, sealing, and checking all contribute to its record setting speed, recognized by the Guinness Book of World Records as the world’s fastest document inserting system. For large volume document processing, the K3000 delivers more mail per hour, saving both time and money. It can fold each document either individually or in groups. In the time it takes to read this sentence, the K3000 can group and fold over 200 documents! The systems incomparable speed begins at the advanced cutter. Excellent cutting quality is achieved whether starting from rolls or continuous stacks. Ease in employment is tried and tested and the cutting-knife unit can be changed in no time. The right information to the right people at the right time. This was and always will be the main principle of any Kern system. The K3000 is an advancement in document management with better technology and processes. The K3000 is equipped with an advanced reading system, ensuring that the contents of each finished mail piece are accurate. Kern’s packing pocket has evolved from its original design on Kern’s early T-Line inserting systems to what is currently used by the most demanding production mailers around the world. Kern’s innovative packing pocket is designed to insert with no friction between the envelope and documents. Recognized as the world’s fastest document inserting system by the Guinness Book of World Records, the K3000 can achieve incredible speeds to get your job done. The K3000 processes mountains of envelopes world-wide – and yet in place it remains very modest with small space requirements, few moving parts, and short transport paths. Not only can the K3000 achieve fast insertions, but it can also change formats in seconds, leading to increased productivity for your jobs. The control center of the K3000 controls and commands the system’s processes. Relevant information is always highlighted on the touch screen for the operator. Numerical values, volume amounts, access rights, and more are portrayed clearly for better system management. As an aid in pin- pointing error sites, a corresponding location image appears on the screen to accurately locate problems and reduce down time. The control panel is adjustable, giving operators the flexibility needed for optimum efficiency.